Want to try great apps without hurting your wallet? We’ve selected 32 iPhone, iPad and iPod touch apps that are now free. This book apps gone free alert includes Snow White, The Fox and the Grapes, Beauty and the Beast, Swan Lake, Twelve Dancing Princesses and many others. Remember, prices can change quickly and without notice, these apps may not be free anymore when you read this post. For the latest app deals, check out our Apps & Games section, as many free apps uncovered over the last couple of days are still free today. The storytelling has never been so engaging! We used to just read poems. Now you can be creative and have fun with it. Your child will love it! Find all interactions that are hidden in the pictures – there are plenty of sounds and animations to play with. Encourage your child to solve several interactive tasks, which will not only entertain but also educate your child. “The Locomotive” can also be read as a traditional, paper book – show your child how fun it is to read. We have taken precautions to make it impossible for you child to get directly connected to Internet from this app. An ageless children poem in a form that has never been seen before. “The Locomotive” by Julian Tuwim will take you on an interactive journey by train through beautiful landscapes to the sounds of cheerful musical background. The story is engaging and there are simple tasks to entertain your child on the railway station and on the way. Your child has several wagons to play with – you can play the piano, arrange scattered bags, feed animals, make a „BOOM” with a big cannon, and so ons. In our application you will find illustrations of extraordinary quality and lots of funny animations. Kids learn to read while playing within this ageless poem written by Julian Tuwim, a well-known Polish poet. Apart from the interactive story, this application offers also a more traditional way of reading – a book with turnable pages, which can be read by you or you can listen to the warm and friendly voice of L. Harvey Gold. The application includes also a catchy song, composed especially for this application. Just tap on guitar case on menu screen to hear it. 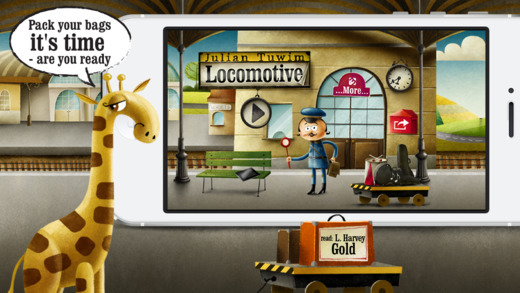 “The Locomotive” is a kid-friendly application. Special safety precautions have been taken to make it impossible for your child to accidentally connect to the Internet. In order to use social media functions or to buy this app as a gift for your friends, you need to hold your finger on the post box for five seconds. The app has been designed for iPhone 4, iPhone 5, iPad and iPod Touch. You can also get a selection of drawings to be colored or cut out – visit http://locomotive.bigrabbit.eu to download free bonus materials.